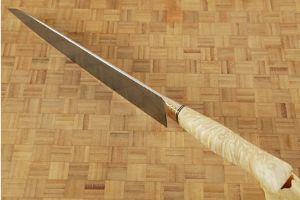 The blade was hand forged from 52100 carbon steel, ensuring a keen, long lasting edge. Like his hunting knives, this chef's knife was pre-tested for edge flex and cutting ability before assembly. The heat treatment followed the formulas developed by Bill Burke in conjunction with Mastersmith Ed Fowler and creates some of the sharpest and most long lasting edges found anywhere. 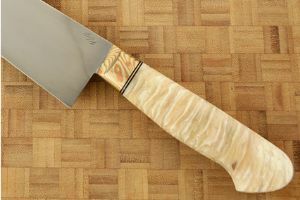 The mokume gane bolster was precision fit to blade and handle for strength and durability. The elegant damascene lines in the mokume were created by forging multiple layers of copper, brass and nickel. 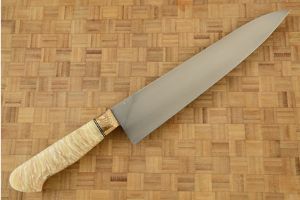 The handle is formed from extremely rare high Arctic muskox (Ovibos moschatus) horn. Muskox horn is one of the most rare and majestic handle materials used in the knife world. 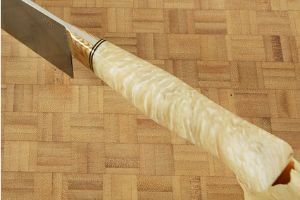 The highly polished horn has a unique grain structure that immediately grabs the eye. 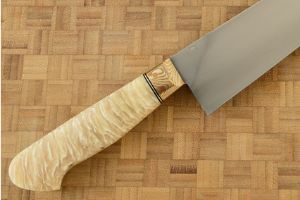 It is nicely carved to swell at the palm, move into a slimmer waist and finally to swell again at the end of the handle. 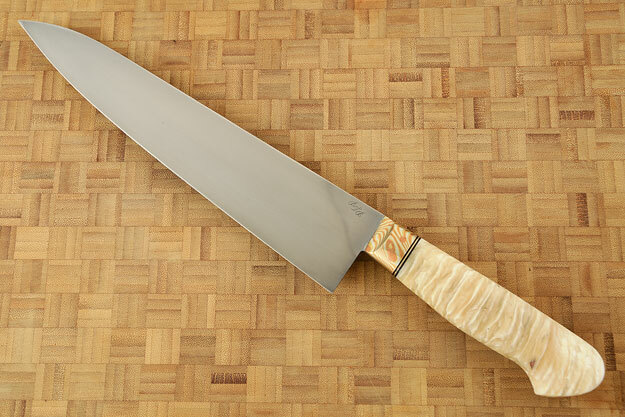 The high performance chef's knife has perfect balance and feels exceptional in the hand.